So, I watched Supernatural‘s 200th episode last week. For the record, I don’t really watch the show. However, I figured I had enough of a working knowledge from tumblr to be able to appreciate the anniversary musical episode. I always find musical episodes on otherwise nonmusical shows interesting, even if I don’t know the show that well, because, unlike on stage, there has to be a reason the characters are bursting into song. Whether it be a feverish hallucination, a Chicago-style daydream, or even a demon who kills by getting emotionally supressed people to sing and dance their feelings. These musical episodes also often provide anthems for long-standing themes and relationships in the show (see: “Guy Love” from the Scrubs episode “My Musical”). 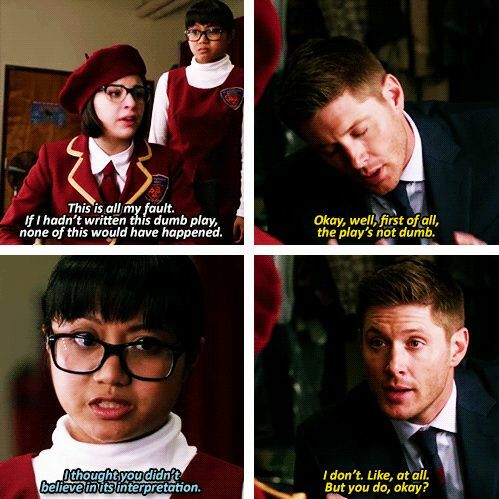 But, Supernatural‘s musical episode, entitled “Fan Fiction,” is unique in that the characters from the show don’t actually sing about their feelings. 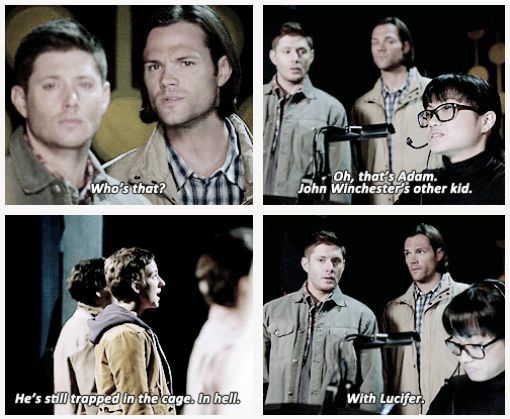 Actually, the main supernatural-hunting brothers, Sam and Dean Winchester, balk at the idea of musical theater (though Sam apparently ran tech for Our Town and Oklahoma in high school). But because Supernatural has a book series in-universe that is based on the lives of the characters, with a fanbase not dissimilar to Supernatural‘s real life fans, they were able to create a meta musical commentary not just on the Supernatural universe, but on how its fans enjoy it. In short, the musical episode was created in the style of a fan adaptation. 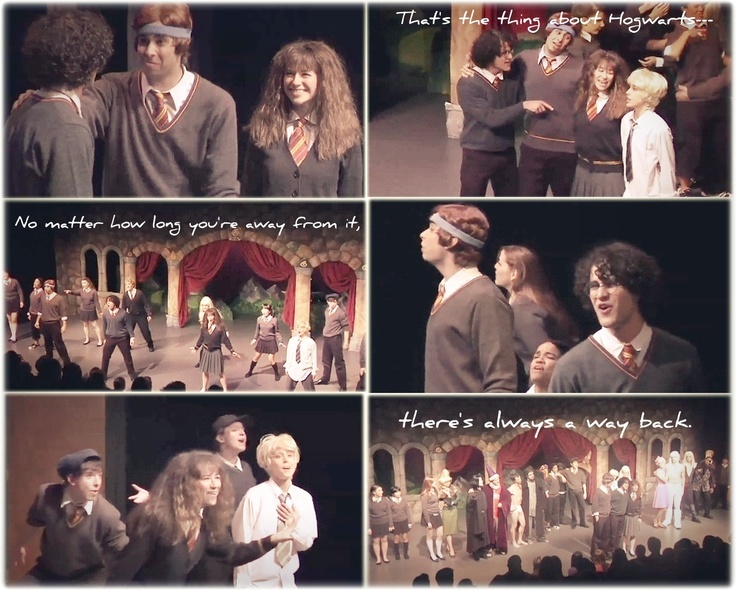 And when I think of fan adaptations, I can’t help but compare to the marvellous works of Team Starkid. If you have no idea what I’m talking about, Team Starkid is an amateur theater group of mostly University of Michigan alums who in 2009 created Harry Potter the Musical, a mashup parody of J.K. Rowling’s novels. It was later uploaded to Youtube under the title A Very Potter Musical, where it gained massive appeal from Harry Potter fans. Two more Potter musicals were created, along with fan parodies of Batman, Aladdin and related Disney films, and Star Wars, two original musicals, concert tours of songs from these shows, and other collaborations. Anyway, looking at the Potter musicals specifically, I couldn’t help but draw a number of parallels between these and Supernatural‘s “Fan Fiction.” Though the Potter musicals, as parodies rather than earnest adaptations, took a lot more liberties with the plot and character personalities, both musical adaptations are love letters to the fans, combining humorous commentary on canon, alternative character interpretations, and surprisingly emotional moments – “All set to music you can really tap your toe to,” as the one-off villain of Supernatural states. Similar in style and in tone, the opening numbers introduce a familiar story in an unfamiliar (and kind of… catchy) way. There is a sense of adventure in all three that is perhaps more reflective of the fans’ affections towards the show than the characters’ towards their lot in life (though the canon Harry Potter would, I’m sure, embrace “Back to Hogwarts” as an anthem himself). “Harry Freaking Potter” and “The Road So Far” also bear comparison, as they sum up a very tragic backstory in an upbeat way that is at once humorous and slightly horrifying, but also conclude with a resolve to rise above an “awful past,” something which fans love in both canon works. As reflections of the fanbase, “Back to Hogwarts” and “Harry Freaking Potter” both sum up fans’ love of Harry and Hogwarts, while “The Road So Far” has already been embraced on tumblr as a way to explain the long-running show to outsiders. They are both clearly amateur productions, and embracing the low quality in this way allows the audience (and Sam and Dean themselves, in the case of Supernatural) to forgive this as part of the charm. In the end, it’s for the fans, and both works feature great shout outs to fans and how they make a work their own. In Supernatural, the brothers’ struggles become the fans struggles; in Harry Potter, fans found a home. Even if your interpretation is entirely different from what the authors had in mind, it is still valid and still has meaning. Both shows make this message loud and clear, and that is why they have the distinction of being fan musicals. 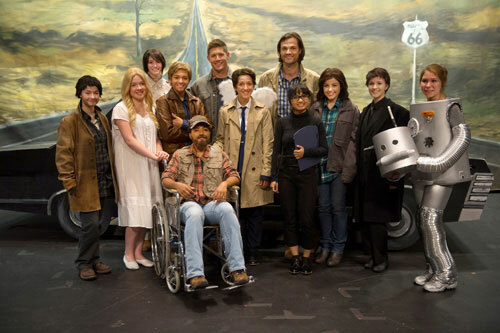 So, in conclusion, despite “Supernatural the Musical” technically being a canon work, it does a great job of mimicking the style of fan works such as the Starkid musicals, and thus succeeds in resonating with the fans it has aimed the message for. * I did want to make a note of “I’ll Just Wait Here Then” as an excellent musical adaptation of a single line, but couldn’t think of a similar song in the Potter musicals to compare it to.